Are you about to set up a Joint Venture with another company? For those company owners that want to set up a joint-venture, and will sign a JV Letter of Intent, we provide this elaborate template. 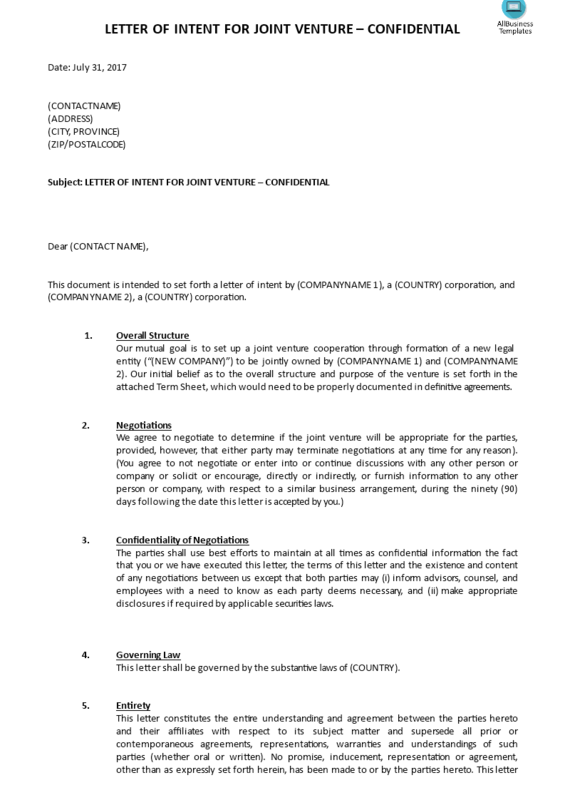 Download Joint Venture Letter Of Intent Template now! We provide a professional business Letter Of Intent for Joint-Venture Between Two Companies. This Legal Writing can be used when two Parties are in discussion to establish a Joint Venture together. This Joint Venture Letter Of Intent (LOI) may also be referred to as a Joint Venture Term Sheet or Joint Venture Discussion Sheet. Our legal templates are all screened and updated by Legal professionals. Download this Template if you are in this situation and save yourself time and reduce the lawyer-fees! We still recommend consulting local law firm to support the Setup of your Joint-Venture. How To Write An Appealing Cover Letter? How to write a cover letter? We provide the best professional, formal and basic letter of cover templates for you, which you can send together with for example your: Resume, Quotation, Memo, Contract, etc.